Just 1 hour north of Sydney. Beautiful bamboo waterfront house. 25 metres of flat lawn to water's edge of Lake Munmorah, at front of house. At the back, your very own secluded tropical oasis. Massive resort lagoon pool surrounded by luscious palm trees. A walkway bridge leads to a covered island in the middle of the pool. Massive deck also overlooks pool. Enjoy a candlelit dinner on your own island, catch prawns for lunch at the lake edge or hire a boat across the lake. Tennis courts are available for hire. Book a boat or a Boat Cruise for your stay-ask us for details. 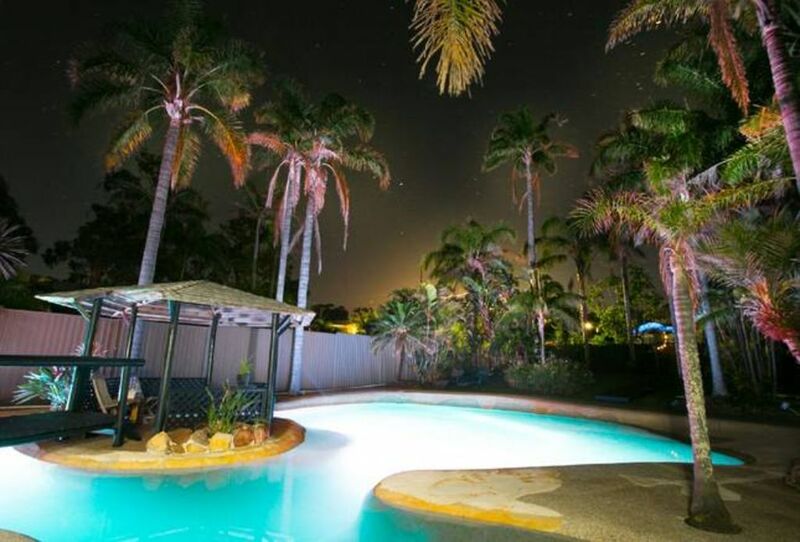 Beaches/Bushwalking/Horse-riding 5mins away, Great Golf Courses 10mins away. Indulge! Mobile Beautician available for a massage on the island. The Lake us renowned for its fishing, so make sure you bring your fishing rod along!!! Lake Munmorah; 55 mins from start of F3 at Sydney. 40 mins South of Newcastle. The pool is awesome. The view is beautiful. Great place to take your dogs. Our pugs loved it. Nice to sit on the patio with wine & cheese and throw the ball for the dogs and enjoy the view of the lake. We will go back. From the moment we walked through the gate we fell in love with this little gem! Awesome private pool, beautiful little home, pet/dog friendly & stunning lake views - what more could you want! Our doggo had the best time too. Eddy is an absolute legend, so helpful & very accommodating. Thank you so much & we can’t wait to be back!! When you open the lounge and bedroom glass doors all you see is the lake & stunning wildlife. It really is a beautiful view. The pool is good fun and the house is a great holiday house. It was a pleasure having you visit Waterfront Oasis and we are glad you enjoyed your holiday. You are most welcome back any time. The house could definitely use a bit of tlc but over all we had a great break with our doggos and we all very much enjoyed the pool! Everything is close by, shops, beach, some restaurants, the Doylo just down the road. Very handy being so close to Sydney too. So certainly worth a stay and Eddy was fantastic to deal with, but lost a star due to the house needing a bit of love. It was my first real get away with my 2 children, aged 7 and 11. We loved it and would love to come back again. Our family with younger children stayed here in January. The highlight would have to be the private pool which was lovely and warm. The house and kitchen were well furnished and included some pantry basics. We visited with our dog and the outside area was very dog friendly. She also enjoyed her walks along the lakefront each day and dipping her paws in the shallows of the pool to cool off. The house was centrally located to beaches, shops and other areas of the coast we visited. We had an issue with the tv which Eddy went out of his way to get fixed quickly. The only downside was the bbq wasn't working properly so could not be used. Luckily my husband had a portable bbq in his car that we used most days. Was a great place for our family summer beach holiday. Thank you Nicole for your stay and your great review and feedback. Sorry about the BBQ, we have now purchased and new one for installation as we had no idea it wasn't working well. Hope to see you all again in the future.